We’re fascinated by the amazing work that our customers produce every day. From fantastic bead weavings to stunning tapestries and innovative art spanning many mediums, we want to hear from our customers about what they create. Beginning with this guest blog post by the artist Anthony Locane, we’ll periodically be featuring guest posts from our customers. Do you have a suggestion for a guest blogger who weaves on a Mirrix? Let us know by emailing elena@mirrixlooms.com. 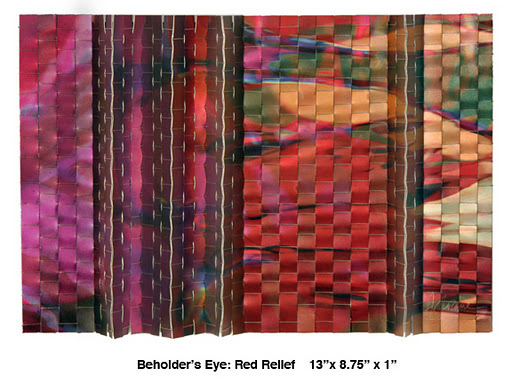 I call my art “Digital Woven Art” because it combines two of my favorite things … weaving and digital art. More on the RELATIONALshifts aspect later. I fell in love with weaving back in undergraduate school when I was an art major at Buffalo State College, part of the State University of NY (SUNY) system. The Design in Fibers class covered weaving (both floor and frame tapestry) along with all other fiber arts (macrame, stitchery, quilting, etc). Since that moment, I have never lost my love or enthusiasm for weaving. Fast forward many years and I was a graphic designer, having taught myself how to design on the computer. During those many years in the corporate design world, I always dreamed of living the life of a producing artist; but time and work always seemed to get in my way. Then in 2004, I changed my life. I quit my full time job in marketing and decided to fulfill my dream. I knew I wanted to somehow combine my love of weaving with my digital skills. I started by painting and drawing, in Photoshop, over a digital photograph of my friend. I manipulated the photo and created many variations until I had about 20 images. After a few days of wondering what I would do next with these images, I suddenly had the thought of weaving them together into a new and different image. But how could I weave paper; unless I resorted to a method I remembered from my elementary school days of weaving paper strips against each other? 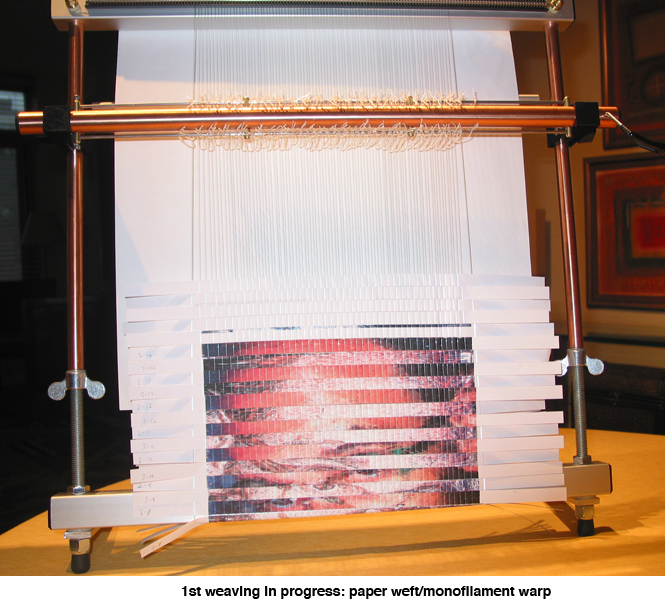 Having determined that my work would best be suited for an upright tapestry loom, I decided on the Mirrix loom because of its metal construction that would hold up to the rigorous tension demands of my warps and its unique shedding system that facilitated weaving with my paper strip wefts. Back in those days, I would print out each version (sometimes 20-30) of the digital image I created, cut each version into strips and weave selected strips from the various versions to create my new image. Needless to say it became a very expensive process as many strips lay unused. After several months of experimenting, I developed a proprietary method whereby I can actually simulate a weaving on the computer screen and experiment with selecting strips from my various versions. I save tons of paper and ink now and often only need to print out 1-3 versions of an image to create my final piece. As I weave, I often deviate from my planned image to find that my intuitions and spontaneous decisions lead me in new and more interesting directions. Today, I employ three graphic software packages in designing my pieces; each forming one step in my design process. 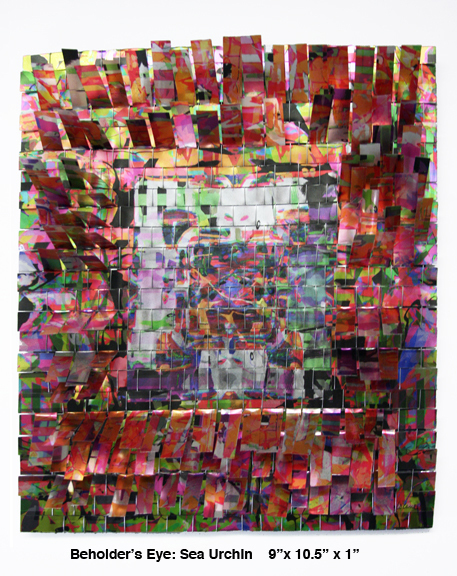 I still start with a digital photo that I manipulate by painting and drawing over; but often I will paint on the final woven piece after it is removed from the loom; or I will go in and remove ink from the piece by bleaching and painting over with water or rubbing out areas. After a one-man show in 2007 and my first group show earlier this year, I became interested in working in metal. My Masters Degree is in sculpture and I have always wanted to go back to my 3-dimensional roots. I since have purchased a large-format Epson printer with the capability of printing on metal sheets. My warps are now wire … usually in the 20-30 gauge size and either aluminum or copper. 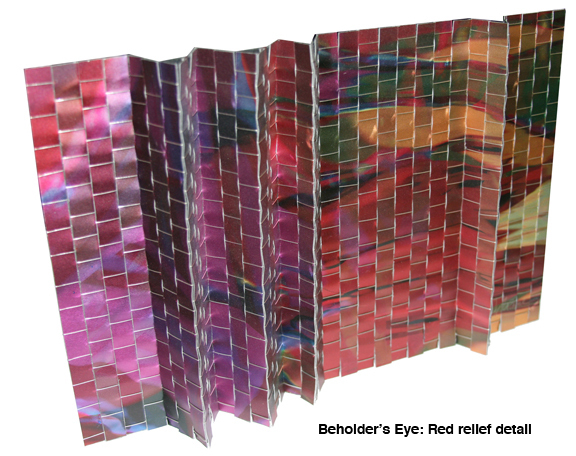 My wefts are specially treated aluminum and copper sheets that accept Epson pigment-based inks that are archival; meaning they will last 75-120 years if framed or enclosed in plexiglass or glass and not subjected to direct, intense sunlight. Weaving metal wefts against wire warps allows me to manipulate the pieces into 3-dimensional forms after removal from the loom. My work is all about relationships to people in my life, places, and ideas and concepts. I first began with portraits (FACEscapes) since I have always been obsessed with faces. Next came my LANDscapes and then my abstracts that I call my MEMORYscapes. Each has transformed as I progress with my art. My earlier portraits were very personal, as were my landscapes. My new work, while still very personal to me, exhibits a more universal quality. Portraits illustrate more of a greater human condition while my MEMORYscapes are leading me into areas that push my boundaries or preconceived notions of my world. 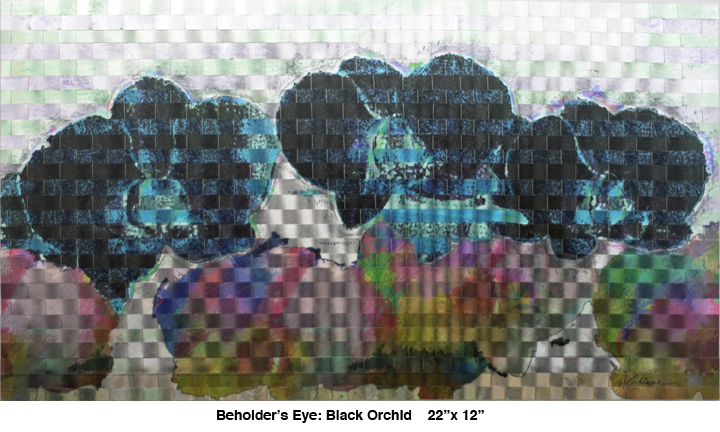 I am currently working on my Beholder’s Eye series; exploring the concept of and what constitutes beauty. I am currently part of a group exhibit, the National Juried Small Works Show, at the Windsor Whip Works Art Gallery in Windsor, NY. 56 artists (primarily painters) from across the U.S. were selected to present their best works. 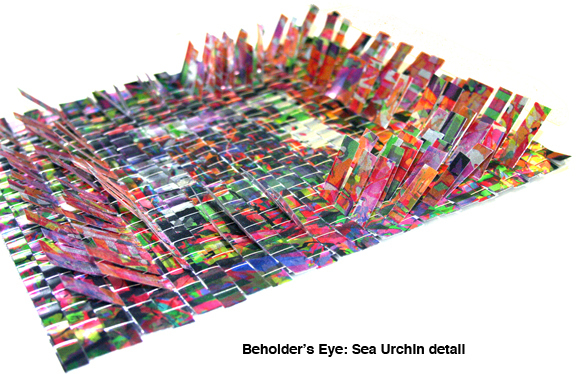 I am delighted to announce that I won 1st Place: Best in Show for my piece, “Beholder’s Eye: Sea Urchin.” Not only is it validation of my work, but also that weaving has a place in the fine art world. True, my work is not traditional tapestry; yet I cannot help think that with intention and imagination, anything is possible. The medium does not determine criteria in categorizing fine art. My computer and looms are merely my tools.